This guide is based on the MLA Handbook, 8th ed. For more details and examples, consult the MLA Handbook. This is a print reference volume which is available in the Ely Library Reference Collection (REF LB 2369 .M53 2016). This is a print reference volume which is available in the Ely Library Reference Collection (REF LB 2369 .M53 2016). Page Contents- Click on a link to jump to that section. Place the list of works cited at the end of the paper. 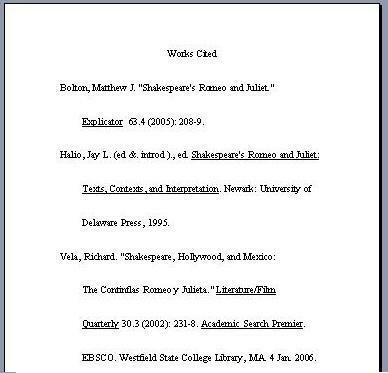 Center the title, "Works Cited", one inch from the top of the page. Double space between the title and the first entry. Double space both within and between entries. Begin each entry flush with the left margin. Indent subsequent lines one-half inch (five spaces). Alphabetize by the author's (or editor's) last name. Entries without an author are alphabetized by title. Author's Last Name, First Name. Title of the Book. Place of Publication: Publisher, Year. Medium of Publication. Fukuyama, Francis. Our Posthuman Future: Consequences of the Biotechnology Revolution. New York: Farrar, 2002. Print. If the book has two or three authors, list all of the authors. If the book has more than three authors, list the first one, followed by et al. The same rule applies when listing editors of a book. Block, Holly, et al. Art Cuba: The New Generation. New York: Abrams, 2001. Print. Salzman, Jack, David Lionel Smith, and Cornel West, eds. Encyclopedia of African-American Culture and History. 5 vols. New York: Macmillan, 1996. Print. Author's Last Name, First Name. "Title of the Work." Title of the Anthology or Collection. Ed. Editor First Name Last Name. Place of Publication: Publisher, Year of Publication. Page Number Range. Medium of Publication. Walker, Timothy. "Sign of the Times." The Transcendentalists: an Anthology. Ed. Perry Miller. Cambridge, MA: Harvard University Press, 1950. 560-563. Print. Author's Last Name, First Name (if available). "Title of the Article or Entry." Title of the Reference Book. Vol. Volume Number. Place of Publication: Publisher, Year of Publication. Medium of Publication. Bolz, Frank A., Jr. "Lindbergh Law." Encyclopedia of Law Enforcement. Vol. 2. Thousand Oaks: Sage Publications, 2005. Print. Piccarella, John. "Hendrix, Jimi." The New Grove Dictionary of Music and Musicians. 2nd ed. Vol. 11. New York: Grove's Dictionaries, 2001. Print. "Northern Right Whale." Beacham's Guide to the Endangered Species of North America. Ed. Walton Beacham, et al. Vol. 6. Detroit: Gale, 2001. Print. Articles featured in the Gale series of literary criticism come from two different kinds of sources, books and periodicals, and the citations will differ depending on which type of source the article was originally published in. Citations must include information for the original book or periodical and the Gale series volume in which it is found. Freibert, Lucy M. "Control and Creativity: The Politics of Risk in Margaret Atwood's The Handmaid's Tale." Critical Essays on Margaret Atwood. Ed. Judith McCombs and G.K. Hall, 1988. 280-91. Print. Rpt. in Contemporary Literary Criticism. Ed. Jeffrey W. Hunter, et al. Vol. 135. Detroit: Gale, 2001. 13-18. Print. Malmgren, Carl D. "On the Road Reconsidered: Kerouac and the Modernist Tradition." Ball State University Forum 30 (1989): 59-67. Print. Rpt. in Twentieth-Century Literary Criticism. Ed. Linda Pavloski and Scott Darga. Vol. 117. Detroit: Gale, 2002. 204-9. Print. Author's Last Name, First Name. "Title of Article." Periodical Title Volume number.Issue number (Date of publication): Page number range. Database Name. Medium of Publication. Date of Access. <URL>. Cummings, Scott T. "Interactive Shakespeare." Theatre Topics 8.1 (1998): 93-112. Project Muse. Web. 14 Aug. 2003. <http://www.press.jhu.edu>. Danto, Arthur C. "Paint It Black." Nation 18-25 Aug. 2003: 46-48. Academic Search Premier. Web. 14 Aug. 2003. <http://www.ebsco.com>. Note: The URL is an optional element in the latest edition of the MLA Handbook and may or may not be required by your instructor. Author's Last Name, First Name. "Title of Article." Periodical Title Volume number.Issue number (Date of publication): Page number range. Medium of Publication. Carter, Nancy Carol. "The Special Case of Alaska: Native Law and Research." Legal Reference Services Quarterly 22.4 (2003): 11-46. Print. Dusinberre, Juliet. "Pancakes and a Date for As You Like It." Shakespeare Quarterly 54 (2003): 371-405. Print. For most magazine articles, you only need to cite the magazine's date of publication (no volume or issue number). Goodell, Jeff. "The Plunder of Wyoming." Rolling Stone 21 Aug. 2003: 64-69. Print. Gladstone, Valerie. "Shiva Meets Martha Graham, at a Very High Speed." New York Times 10 Aug. 2003, New England ed., sec. 2: 3. Print. Author's Last Name, First Name. "Title of Page/Document." Title of the Web Site. Sponsoring Organization, Publication/Updated Date. Medium of Publication. Date of Access. <URL>. "Argonne Researchers Create Powerful Stem Cells From Blood." Argonne National Laboratory, 24 Feb. 2003. Web. 10 Jan. 2004. <http://www.anl.gov/ Media_Center/News/2003/news030224.htm>. Bromwich, Michael R. "Criminal Calls: A Review of the Bureau of Prisons' Management of Inmate Telephone Privileges." United States Department of Justice, Aug. 1999. Web. 10 Jan. 2004. <http://www.usdoj.gov/oig/special/9908/exec.htm>. Weart, Spencer. "Aerosols: Effects of Haze and Cloud." American Institute of Physics. Web. 3 Jun. 2005. <http://www.aip.org/history/climate/aerosol.htm>. You should cite your use of "another's words, facts, or ideas." Citations in the text must clearly point to specific sources in the list of works cited. Citations include the author's name and the page numbers if available. If an author isn't available, use the first one or two words of the title enclosed in quotation marks. When a web page lacks numbering, omit page numbers from your parenthetical citations. Do not use page numbers generated on a printout of a web document. PDF documents found on the web will have page numbers that can be used. "In the year 1824, some 13,000 black Americans emigrated to Haiti..." (Salzman, Smith, and West 3: 1348). This led to a rule requiring avoidance measures within 500 yards of the whales ("Northern Right Whale" 105). ... an article about W.P.A. writers (Brinkley, "Unmasking" A15). "From 1897 to 1917, Storyville...became the world's most famous red-light district" (Brinkley, "American Heritage" 382). Note: if the author's name is included in a sentence, only the page number need be cited. The author's analysis of occupations reveals that "virtually all female convicts were poor or working-class" (Dodge 114). Watts and Bahill conclude that "outlawing aluminum bats would produce faster batted-ball speeds" (144). The themes and context of the novel draw on French feminist theory (Freibert 16). ...in his painting of Fidel Castro greet the Pope (Block, et al. 140).